by Michael Harding on October 18, 2012. Mike and Jim Ring got a Torino from their dad when they were kids. They worked on it every week, and painted it often. As the saying goes, that is where it all started. The Ring brothers began working on cars and building customs, and now their names are synonymous with unique cars and cool customs that have been a part of the musclecar crowd for years. With cars to die for, and custom work that stands apart from many others that has made a name for Ringbrothers, they became the first shop to win the Goodguys Rod and Custom Association Street Machine of the Year for two years in a row. This year they won for a third time with “Producer”, the beautiful 1965 Mustang fastback you see in this article. While many shops and builders don’t like to share trade secrets, the Ring brothers are more than willing to share what they do and what they know – including what works well for them. 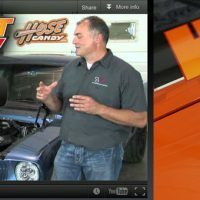 With all of the customs they’ve had over the years, the one product that both Mike and Jim wish they had for earlier builds is Hose Candy. As Mike stated in the video, they used to hide the hoses as much as possible because you just can’t make metal hose clamps and rubber hoses look pretty. Hose were stuffed under fender wells, behind other parts, anything to get the black rubber hoses out of the picture. Hose Candy entered the scene and Ringbrothers doesn’t have to hide hoses anymore. In fact, they like Hose Candy so much that they have put together the video above, and they also provide us with five Hose Candy secrets. Now they’re back to putting the hoses where they go: in the engine compartment in plain view just like the rest of the engine. The big difference with Producer now is that Hose Skins are proudly displayed and Hose Candy completes the look for this Mustang. For hose clamps, the Boa Clamps continue to give the dynamic clamping force necessary without leaks, and are a welcome replacement to the ugly steel clamps. Sidewinders are a great connection for smaller vacuum lines, making disconnecting small lines quick and simple with their twist-lock connectors. Hose Bones works great for hoses that need to be shaped to clear other components under the hood, as shown in the video. With an endorsement like this from Ringbrothers, you know Hose Candy is going to be seen a lot more under the hood – and at major automotive events across the country. We proudly use Hose Candy on our own projects here in our shop, too. Check out the Hose Candy web site to see their variety of colors and styles to complement or contrast your engine, and stop hiding those boring hose! Hose Candy can greatly enhance the looks of your engine compartment, and Ringbrothers proves it!